Payroll processing: calculate, prepare, and delivery employee payroll checks; prepare payroll tax returns; collect and remit client’s payroll obligations; time tracking, etc. Retirement services: 401(k) plan design, recordkeeping, and plan management services. Insurance: group health insurance, health care reform, workers’ comp, etc. Outsourced human resources: on-site personnel, employee handbooks, compliance services, employee records administration, etc. The company primarily makes money through recurring fees for the services it performs, especially via Paychex Flex, its software-as-a-service platform. 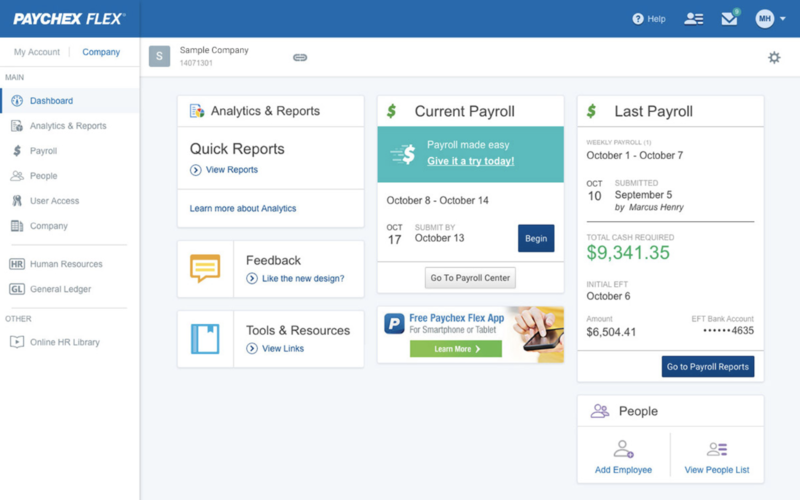 Paychex Flex is an integrated product suite for all things HR - payroll, time and attendance, recruiting, hiring, retirement benefits, and more. Essentially, Paychex helps businesses outsource non-core administrative services in a cost-effective manner so they can focus on their strengths. The company's revenue is driven by the number of clients it serves, how many services each client utilizes, and the number of checks or transactions per client per pay period on the payroll processing side of things. Approximately 52% of Paychex's revenue is derived from payroll services, which includes a growing portfolio of standalone services such as expense management and time & labor tracking. This segment is quite mature and grows around 1% to 2% per year. The remaining 48% of the business is from human resource services, consisting of many complimentary offerings that are often sold to payroll clients, such as retirement, insurance, administration, and human resources outsourcing. Paychex's HR business is growing much faster, usually between 8% and 12% most years. The company's mix has been shifting more into its faster-growing human resource services business, which represented less than 35% of sales in fiscal 2014. As Paychex continues evolving into a broader human capital management (HCM) service provider, revenue between payroll and HR services will increasingly blur. Management expects the split to be closer to 50/50 within a year or two. The services Paychex provides to businesses are mission critical – payroll taxes must be correctly calculated and paid on time; insurance policies must conform with health care regulations; proper records must be kept for 401(k) plans; and more. As a small business owner, you want these jobs done correctly and efficiently. These aren’t tasks you want to lose any sleep or energy over. With fewer resources compared to larger companies, outsourcing these administrative tasks, which are constantly evolving as federal and state regulations change, is usually more efficient. Paychex helps out by maintaining more than 200 on-staff compliance experts who track and responding to changes in regulations, taxes, and laws. The essential nature of its services is why Paychex generally has retention rates of 80% per year, with client losses mostly due to small business failures or acquisitions, not customer defections. Even during recessions the company's retention rates remain strong, exceeding 75% during the financial crisis. Payroll service revenue dipped just 4% during the Great Recession, and peak sales declines never exceeded 5% in its worst year during the crisis. With more than 45 years of operating history, a large direct sales force, numerous indirect sales channels (over 50% of new core payroll clients are referred by existing clients, CPAs, and banks), and a full suite of services, Paychex is the trusted brand of choice. Unlike industry giant Automatic Data Processing (ADP), which is dominant in serving larger customers, Paychex is focused primarily on the small and medium-sized business niche (1 to 1,000 employee companies). The firm's average client has just 17 employees, so such accounts represent relatively small potatoes that ADP isn't eager to target due to the skimpy amount of revenue they represent. This is why Paychex has dominant market share positions in its key businesses. The company is #1 and #2 in payroll services for small and medium-sized businesses, respectively (Paychex pays one in every 12 private sector workers in the U.S.); #1 in retirement services record-keeping (as measured by number of plans); #20 in insurance services; and provides HR services to clients with over 1,000,000 worksite employees. Since mid-2017, Paychex has been aggressively trying to grow its HR outsourcing business through acquisitions. That includes the August 2017 purchase of HR Outsourcing Holdings, a national professional employer organization (PEO) that provides human resource solutions to small and medium-sized businesses in more than 35 states. PEOs basically work by having Paycheck act as a coemployer, meaning that workers are technically employed by Paychex, but work for its clients. The reason this has become more popular is because in the age of increasing regulation and rising healthcare costs, small companies benefit from Paychex being able to not just handle the regulatory compliance issues for them, but negotiate discounts on things like health insurance premiums due to pooling 1 million employees under its PEO banner. In March 2018, Paychex bought Lessor, a payroll and HR outsourcing provider, expanding its presence in Europe. Then, in November 2018, the company announced its largest acquisition ever, the $1.2 billion purchase of Oasis Outsourcing. Oasis is the largest private outsourcing firm in America with 100,000 worksite employees serving over 8,400 clients. This deal, when it closes in 2019, will boost the company's PEO business by over 10% (in terms of worksite employee count). Management expects the deal to have a minimal impact to 2019 earnings per share, due to added interest costs (the deal is being funded partially with debt), offsetting revenue and earnings gains. However, the much larger PEO business should lead to continued strong top and bottom line gains in the company's fastest growing business unit. As long as customers’ administrative needs are being met with quality service at a reasonable price, they have few reasons to switch vendors. Their employees also become familiar with Paychex’s software (about 90% of the firm's mobile app usage comes from its clients’ employees who are doing things such as accessing their check stubs and W-2s), raising switching costs. As a result, more than 110,000 of its clients (over one in six) have been with the company for over 10 years, and client retention remained over 80% last year. Paychex has also evolved to offer clients a larger scope of services compared to many smaller competitors. Going back less than 15 years, Paychex’s business was almost entirely payroll services. However, the company now offers a growing array of human resource services (48% of revenue), which leverage the information gathered in Paychex’s base payroll processing service. Human resource services competitors that lack payroll services must depend on vendors like Paychex to power their solutions, putting them at a disadvantage. Paychex’s broad product portfolio also offers simplification and convenience for customers. For example, the company's solutions scale from one employee to thousands, allowing Paychex to meet its clients along that spectrum without having them change platforms. When working with Paychex, clients have flexibility to handle as much or as little of their payroll and HR tasks as they want. With more cash than debt on its balance sheet, Paychex can also continue acquiring products to fill any service gaps, maintain the most fully integrated product suite available in the marketplace, remain entrenched with its customers, and expand its growth opportunities. For example, in 2016 Paychex paid $191 million to acquire Advance Partners, which serves the temporary staffing industry and provides working capital financing. Paychex previously had no exposure to this segment but can now address the market of more than three million temporary staffing employees in the country. Outside of bolt-on acquisitions and organic improvements to its product suite, Paychex is constantly investing heavily in technology to improve its cloud-based offerings. Although the company's client base has not grown much in recent years (less than 17% since 2007), Paychex benefits from having a massive base of payroll processing clients it can cross-sell HR services to, expanding its revenue per client over time and supporting its industry-leading operating margin near 40%. With more than 11 million addressable business in the geographic markets Paychex currently serves, there should be meaningful opportunity for long-term growth in the human capital management market, especially as smaller companies outsource more. 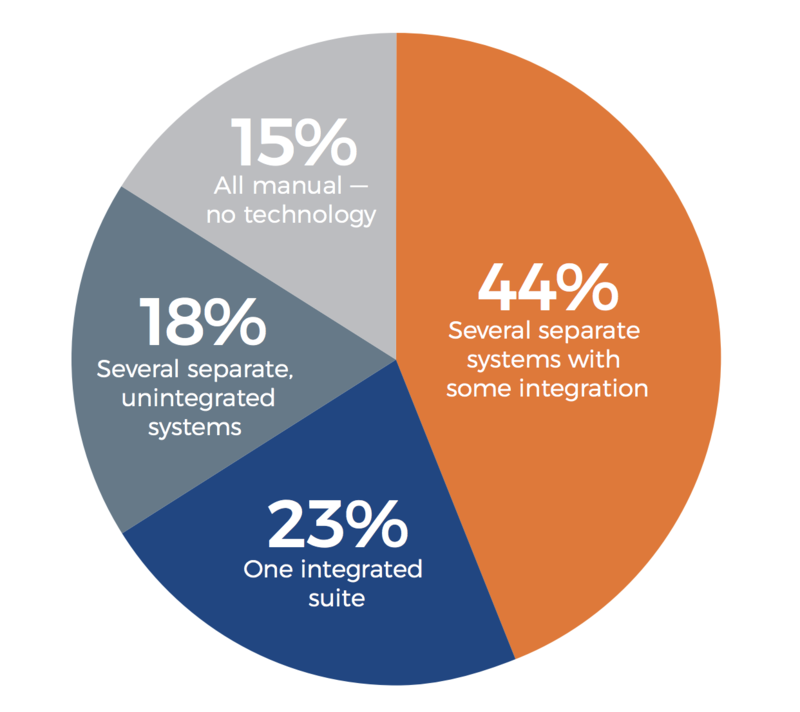 As you can see below, only 23% of the market is estimated to use a single integrated HR suite, and 15% of companies still don't use any technology at all. Finally, it’s worth mentioning that Paychex also earns interest income from investing client funds collected but not yet remitted to applicable tax or regulatory agencies or to client employees (about $3.8 billion in late 2018). With most of the money invested in safe fixed income securities, Paychex would see some benefit if rates rise. For example, pre-Financial Crisis the company usually was able to generate interest yields above 3% on its float. In fiscal 2018 that figure was 1.5%, owing to historically low interest rates. Paychex expects every 25-basis-point change in short-term interest rates to impact its earnings by $3 million to $4 million per year. If short-term rates were to increase by 200 basis points as the Fed continues hiking rates, then Paychex's earnings could increase by more than $30 million (around a 3-4% boost). Despite the scale, regulatory expertise, service breadth, switching costs, and brand advantages enjoyed by Paychex, this is still a fragmented marketplace with fairly low barriers to entry. Unlike many other businesses, Paychex is somewhat insulated because it has very little overseas exposure, is not sensitive to commodity prices, and minimal currency risk. However, the company is sensitive to the U.S. labor market, which has been improving. If the number of businesses starting up and the employees they hire continues to grow, Paychex grows. Fluctuations in interest rates can also impact the company's bottom line over the short term because Paychex holds money for its clients. The business benefits moderately when interest rates rise. Bigger concerns facing the company are the lack of growth available in the company’s core payroll services business, competition from new entrants, and reduced regulations under the Trump administration. For example, Paychex's core business has long benefitted from a lack of strong competition which didn't have the technology to match its service offerings. On the regulatory front, the current administration has made it a priority to cut back on federal regulations. Less complexity could reduce the need for some of Paychex's services. A repeal of the Affordable Care Act could reduce the company's outsourcing services revenue growth, for example. However, state regulations remain onerous and are increasing in many cases, especially with minimum wage laws. Overall, it's hard to say what impact, if any, some of these changes could have on the business. Regarding growth in payroll services, this market is rather mature. However, it continues increasing at a low single-digit pace. More importantly, Paychex has successfully expanded its portfolio over the years to include numerous faster-growing human resource services. These businesses account for a significant part of Paychex’s sales mix (48%) and have consistently grown around 10% annually. Simply put, Paychex has expertise in introducing (or acquiring) new products needed by small and medium-sized businesses, and its existing distribution channels are very effective at quickly scaling up new services. The company seems likely to continue finding growth opportunities adjacent to the payroll services market, especially by cross-selling HR services to its legacy payroll clients. New entrants seem to pose a greater concern. Technology (e.g. the cloud) is accelerating the rate of change in the industry, and start-up costs are increasingly minimal. Newer software companies typically have products that offer better user experiences, lower costs, and greater innovation compared to large incumbents such as Paychex. In recent years startups like Paycom and Paylocity have been able to create ever improving software applications that could pose a challenge to Paychex's growth in the years ahead, even if the labor market continues strengthening. This rising competition could be one reason why Paychex's client count has grown less than 17% since 2007 despite the company serving just 5% of its addressable market. Zenefits is another rival and gives away free software that automates payroll and health insurance for small businesses. The firm had been the big name mentioned as a potential disruptor in the space (the startup launched in April 2013 and was valued as much as $4.5 billion). However, the company has hit a wall of challenges that have severely disrupted its growth path. On the payroll side, Gusto is another company that has emerged as a strong new entrant. Gusto is much cheaper than Paychex and provides a more pleasant user experience, helping it grow to serve more than 40,000 businesses (Paychex serves over 650,000). It also added human resource services several years ago to significantly improve the scope of its offering. Paychex can combat new entrants in several ways. First, it can use its healthy balance sheet to acquire them or invest in similar functionality to stay relevant for its customers. The Oasis acquisition is one example. Fortunately, even if Paychex funds the deal with $1 billion in debt, then its debt / EBITDA ratio will still be below 1, which is quite low and very conservative. The company is also investing in its software to stay “good enough” for customers not to switch. More than 80% of Paychex’s clients now have an online connection to them – accessing reports, using mobile apps, processing their payroll. Paychex will continue investing in cloud-based technology and mobility applications to improve the user experience it provides. In recent years Paychex has managed to maintain strong market share by steadily expanding its service offerings without significantly raising fees. While this has meant a lack of margin expansion (operating margins have been stable at 36% to 39% for a decade), it also helps the company maintain steady revenue growth of about 8% with double-digit earnings growth. Perhaps most importantly, Paychex has strong brand recognition, extensive distribution channels, and trust in the market. Payroll and human resource services must be working correctly 100% of the time. Until Gusto, Zenefits Paylocity, and Paycom establish a longer track record, many of Paychex’s existing customers may be less likely to jump ship. However, they could push for reduced pricing in future contract negotiations. Until there are signs that Paychex is starting to struggle with profitable growth, the highly fragmented nature of the market, secular growth in human resource services outsourcing, and strong brand and sales channels maintained by Paychex seem likely to keep the company chugging along. Paychex is a sticky, time-tested business that provides mission-critical services for its customers and appears to have a highly reliable dividend, which it has paid without interruption for more than 25 years. While the competitive landscape needs to be watched as innovative cloud-based rivals enter the scene, Paychex's strong brand, deep sales channels, broad product portfolio, large installed base, regulatory expertise, switching costs, and flexible balance sheet should help keep the company relevant for many years to come.